Currently available 3D printing filaments are expensive and being imported. Plastic waste is an issue that remains to be solved completely. It is difficult to decompose, thereby causing pollution to the environment. However, there remains to be positive uses for the product as the material is lightweight, easily formed, and cheap. 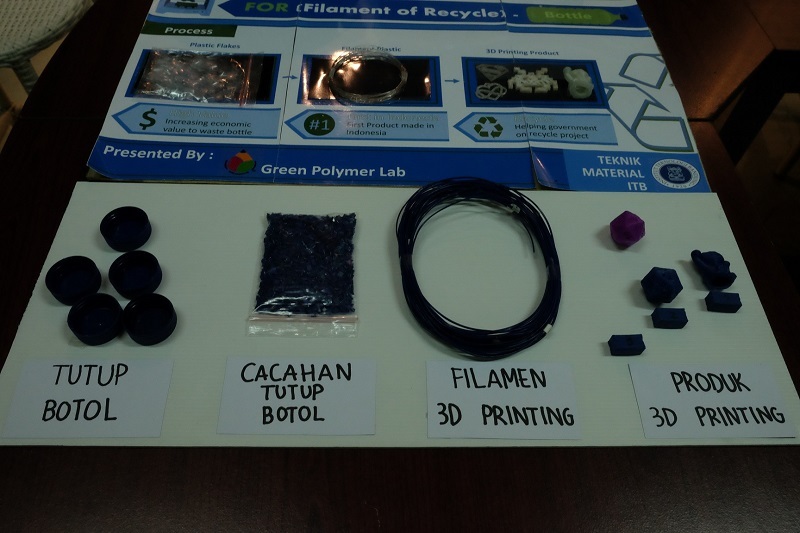 Because of this, a Lecturer from the Bandung Institute of Technology, in Indonesia, conducted research on the use of plastic bottle waste as a filament material for 3D printing products, according to a recent report. Based from its title “Preparation of 3D Printing Filament Made from Thermoplastic Waste”, the study is about using thermoplastics from bottled mineral water as an alternative filament for 3D printing. The use and demand for 3D print filaments has been increasing significantly. But, the available commercial 3D print filaments in the market are expensive and still being imported from overseas. The price of the ABS and PLA type filaments in the market is very expensive. With this problem, the idea of producing 3D printing materials from plastic waste came to being. According to this, ABS stands for acrylonitrile butadiene styrene. Its common products include phone cases, high-wear toys, tool handles, automotive trim components, and electrical enclosures. It can withstand high stress and temperature, and is moderately flexible. PLA, meanwhile, stands for polylactic acid. Its common products include models, low-wear toys, prototype parts, and containers. It has a lower printing temperature and tends to deform around temperatures of 60 degree-Celsius or higher. Thermoplastic is a recyclable material that can be reused into a new product through a heating process. The aim of the study, being conducted by Dr Mardiyati, is to develop 3D print filaments from thermoplastics and be able to characterise their performance. The research and development of the filament took two years. It began in 2016 and was completed in 2018. The Green Polymer Lab at the University’s Faculty of Mechanical Engineering and Aerospace played host to the whole project process. The project was a success, producing 3D printing filaments from bottle cap waste made from Polypropylene and bottled mineral water made from PET. Moreover, the research now has a patent as well. The process of creating the filament from a plastic bottle cap was explained by the Lecturer. The process begins by collecting the bottle cap waste and chopping them into small pieces. After chopping, the pieces are then inserted into the extrusion machine until the product becomes similar to a roll of yarn. This roll of yarn is the filament that will be used as material for 3D Printing. The 3D printing machine was purchased from the market and had to be re-modified so that it will be capable of using thermoplastic filaments.